HomeShort StoriesEmotional StoriesHumanity Comes Before Religion! Once upon a time, in a small town Hindus and Muslims resided together in the same locality. This place witnessed regular Hindu Muslim fights in the name of religion. Azhar Ali and Ramlal were neighbours but would never talk to each other. They had serious faith in their religion and would even take bath if they crossed each other’s path. To make matter’s worst both owned sweet shop in the same street. It was Eid time and Azhar Ali was busy in all the preparations. He along with his family went for the morning prayers and celebrations were in full swing. Moreover, it was business time for Ali. He knew that the Muslims would purchase sweets from his shop and he would frequently mock Ramlal. Even on the auspicious day, regarding the sweet sales, both of them entered into an ugly spat out of jealousy. The neighbours tried to pacify the matter and things were under control. Few hours passed by and there was a huge cry from Ali’s family. ‘Where is my son Jaffar? Where is he? Did anyone see my little boy?’ He started yelling ‘…Jaffar… Jaffar…’ and the neighbours gathered in front of his house. His 12 year old son Jaffar was missing. Everyone came out and started looking for Ali’s son however Ramlal stayed in his home without being bothered. Ali looked everywhere but in vain. Finally he went to Ramlal house and shouted, ‘You monster, where did you take my son. Don’t bring today’s matter into this. Give back my son. What have you done to my innocent child?’ He went and grabbed Ramlal’s collar in anger. Ramlal was very angry at this act in front of all the people. He slapped Ali and pushed him. They both again entered into a nasty fight. Even their wives came out seeing their husband’s fight and they too started quarrelling with each other. The entire area turned into a battle field with Hindus supporting Ramlal and Muslims supporting Azhar Ali. As the fight was getting more and more abusive and ugly, suddenly someone saw Jaffar coming with another man and a kid. Jaffar was all in blood and his clothes were completely blood stained. The kid next to him was none other than Ramlal’s son Suresh. Seeing Jaffar in blood and Suresh next to him, Ali became furious and knocked down Ramlal with several punches. ‘See what your son has done to my kid. Like father, like son. No difference’. Without checking with their son what had happened they kept fighting like enemies. The man replied, ‘Well Sir, I am a doctor by profession and Suresh has just saved Jaffar’s life by donating blood to him. Your kid had met with a serious accident while saving Suresh. He was bleeding heavily and was rushed to hospital. We needed blood for him and both the kid’s share the same blood group. Suresh donated blood without any hesitation. They both are brave kids and share a great bonding. Azhar Ali was shattered and so was Ramlal. Both the kids had taught them a lesson in life. While they were involved in ugly fights, their children saved each other’s life. They stood silently feeling ashamed of their behaviour. Since then both the families became friends and celebrated all the occasion together without any dispute. 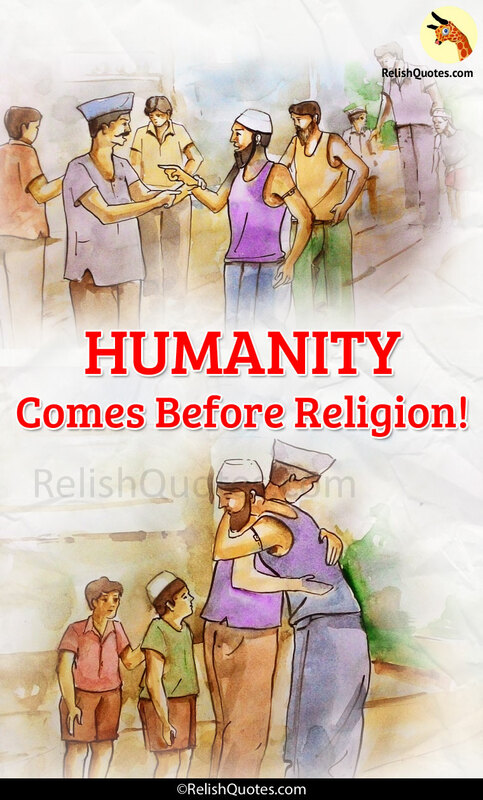 No matter what religion you follow, humanity is beyond everything.